Mesenchymal stem cells (MSCs) are an attractive therapeutic tool for regenerative medicine due to their capacity for self-renewal and the ability to differentiate into a variety of mesodermal lineages [1, 2]. It has been postulated that due to their inherent multipotency, MSCs are able to directly integrate into diseased organs and tissues . 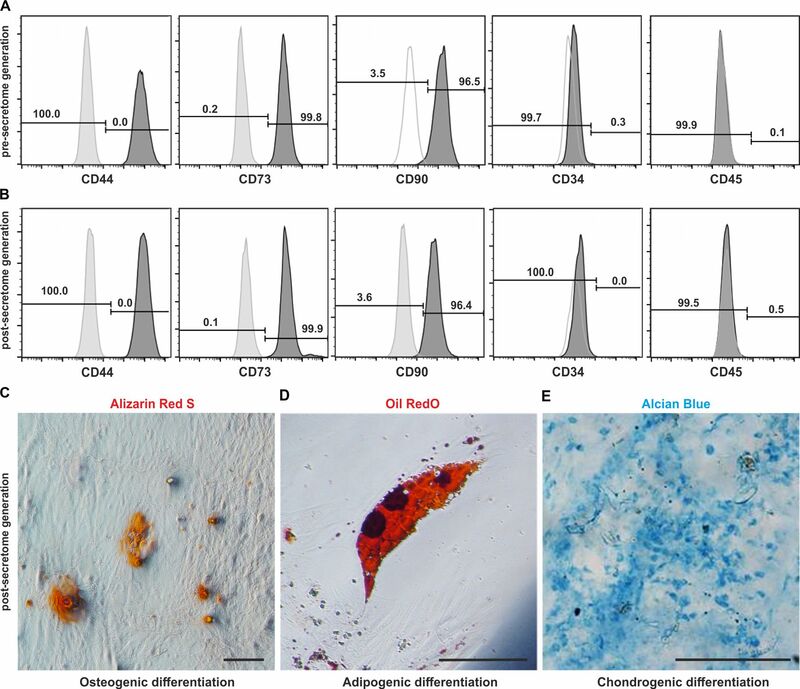 In this context, transplantation of MSCs has been reported to be beneficial in cartilage regeneration , regeneration of bone tissue  and in acute and chronic models of muscle degeneration [6, 7]. However, although these and other studies reported an abrogation of pathology, the level of MSC engraftment into the diseased organs is often negligible (less than 1%) [8–10]. 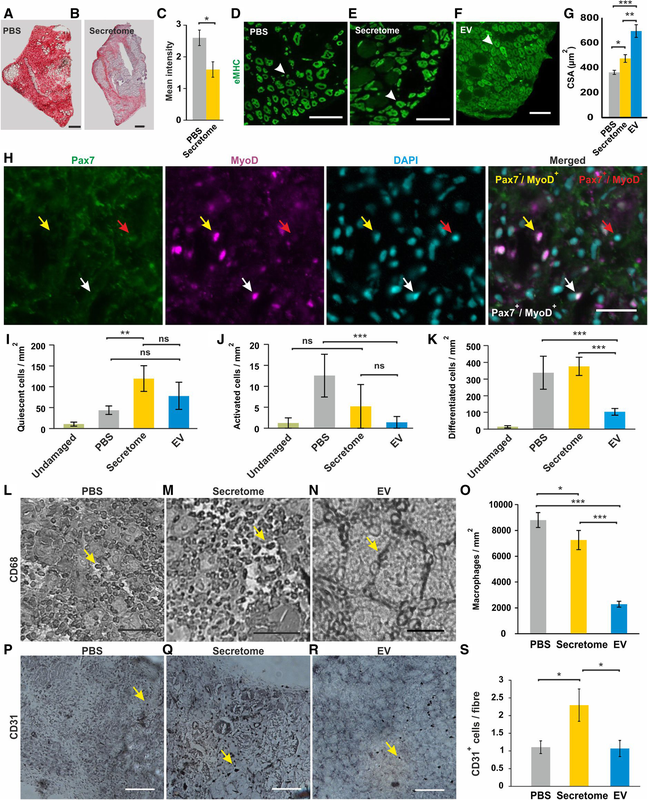 This led to an alternative hypothesis suggesting that factors produced by MSCs acting in a paracrine manner rather than the cells themselves promote tissue regeneration [11–15]. To date, the regenerative effect of factors secreted by MSCs have been investigated in many different conditions including regeneration of the heart , central nervous system (CNS) , kidney , muscle tissue  and wounds  suggesting that the MSC secretome may be as efficacious as the cells themselves. Many studies have also described MSCs as having immune-privilege potential, with several MSC products being approved for clinical application [21, 22]. Stem cells are known to interact and actively communicate with their surrounding microenvironment  via the secretion of cytokines and growth factors including but not limited to insulin-like growth factor-1 (IGF-1) , hepatocyte growth factor (HGF) , interleukins  and vascular endothelial growth factor (VEGF) . These molecules regulate a variety of different cell activities essential in tissue regeneration, such as proliferation, angiogenesis and the modulation of inflammation [21, 27, 28]. Proteins secreted by stem cells are found either as free entities or within membrane particles such as exosomes and microvesicles (MV), collectively known as extracellular vesicles (EVs). Originally considered to be cellular debris, EVs are now understood to play a vital role in cell-to-cell communication [29, 30] and may mediate the immunomodulatory effects of MSCs . In addition to proteins, mRNA, miRNA and organelles are packaged within EVs [32–34] which collectively constitute the stem cell secretome. 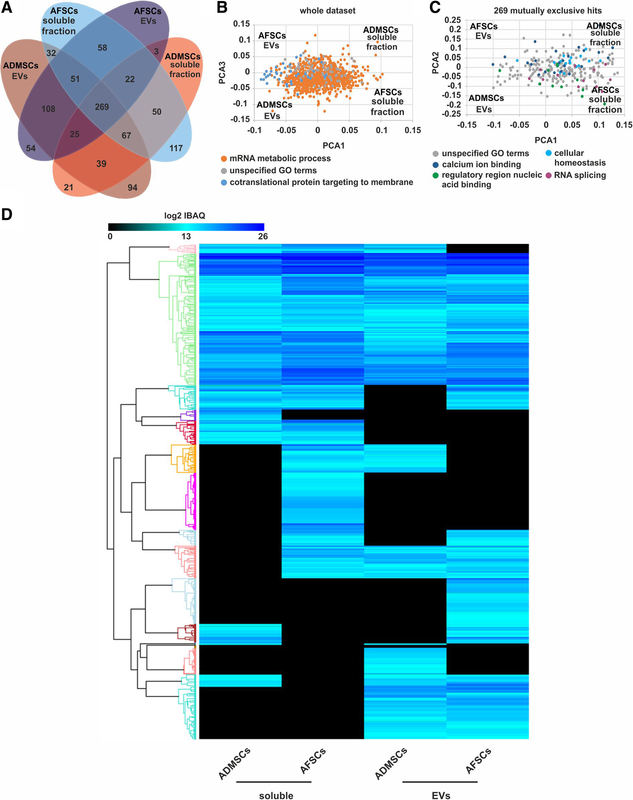 In the present study, we assessed the influence of ADSC-secretome and ADSC-derived EVs on H2O2-induced senescence of IMR-90 cells, a widely used model in cell ageing research [62–64]. Notably, only the total secretomes but not the EV fractions were able to reduce the number of senescent cells (Fig. 2f) suggesting that soluble factors rather than EV cargo is responsible for this effect. The study of Lo Sicco et al. 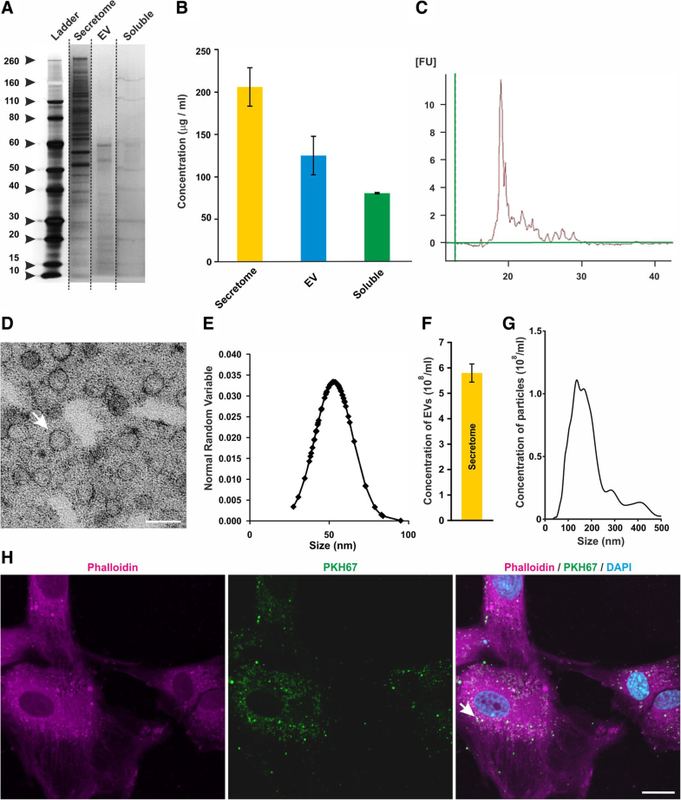 is of particular significance to this work, since they found that hypoxic conditions supported the development of a potent regenerative EV fraction. 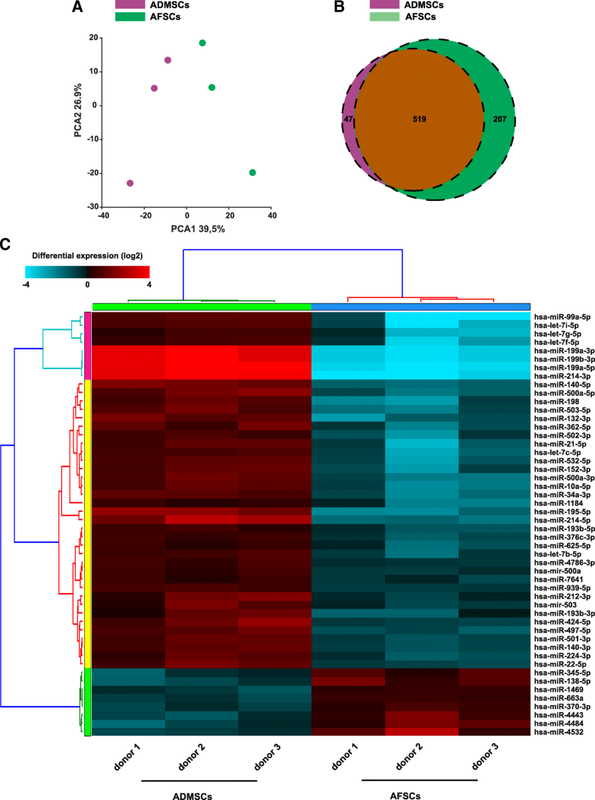 However, it seems that MSCs are extremely labile in terms of the secretome repertoire. Indeed, although a number of groups have shown that the EV fraction of MSC secretomes support muscle regeneration [19, 67], the identity of the putative effective agents differs greatly. For example, Nakamura suggested that the angiogenesis supporting property lay with non-EV VEGF and that the EV encapsulated miR494 promoted myogenesis. Although we see both properties, our EV free fraction lacked VEGF, as well as other angiogenic proteins such as SPRED1, VECAM1 and IGF1, and the EV fraction contained low levels of miR494. This suggests that there are multiple routes to promote key features of muscle regeneration and demonstrates the potential diversity that may result from differential secretome generation protocols. 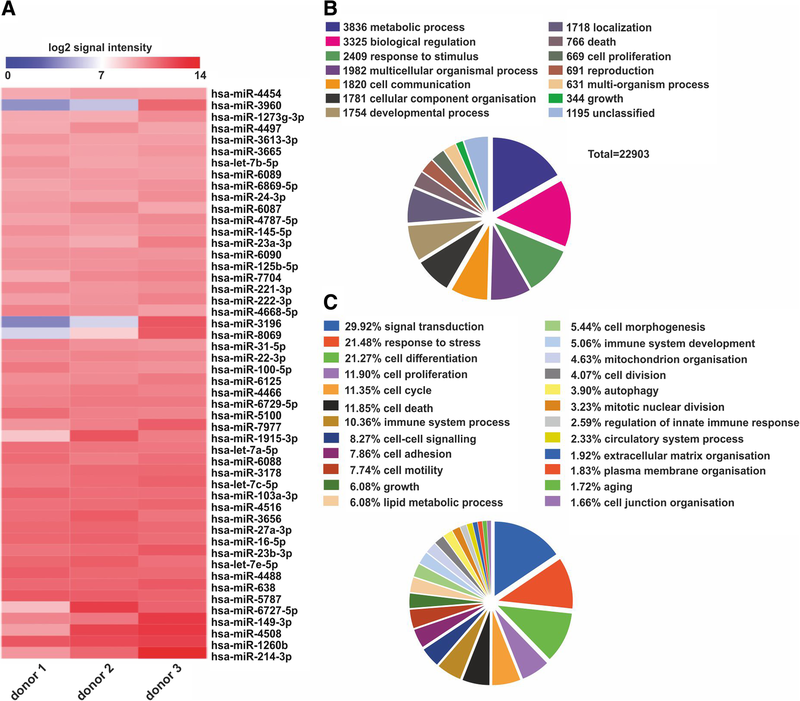 In order to identify the soluble and EV-associated protein components potentially contributing to the effect of the ADSC secretome, we performed an LC–MS profiling with subsequent bioinformatic analysis (Figs. 4 and 6). 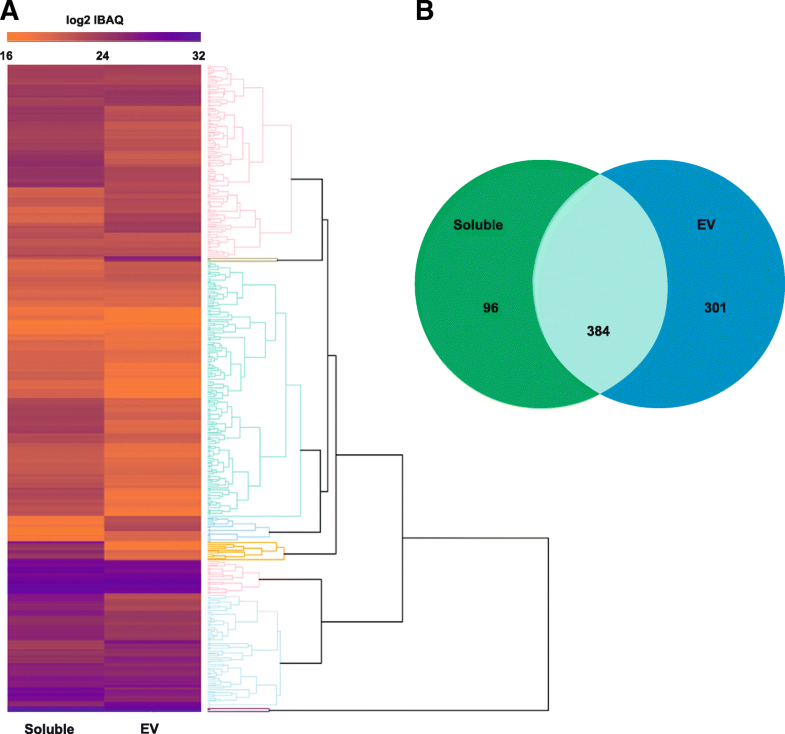 We detected many proteins in the soluble fraction that have previously been described in the MSC secretome, including Heat Shock Proteins (HSPs) (HSP60, HSP90, HSP105). HSPs are produced by cells in response to stressful conditions, such as heat, wound healing or inflammation [68–70] Notably, HSPs have also been shown to enhance regeneration in MSC therapies [58, 71]. Our analysis also revealed the presence of superoxide dismutase (SOD2) that is known to mediate resistance to oxidative stress .